The VideoMic GO On-Camera Shotgun Microphone from Rode is a lightweight microphone which adds high-quality audio recording to your small camcorder and HDSLR camera. At only 2.6 ounces, the microphone keeps your camera setup lightweight, making it ideal for handheld shooting. 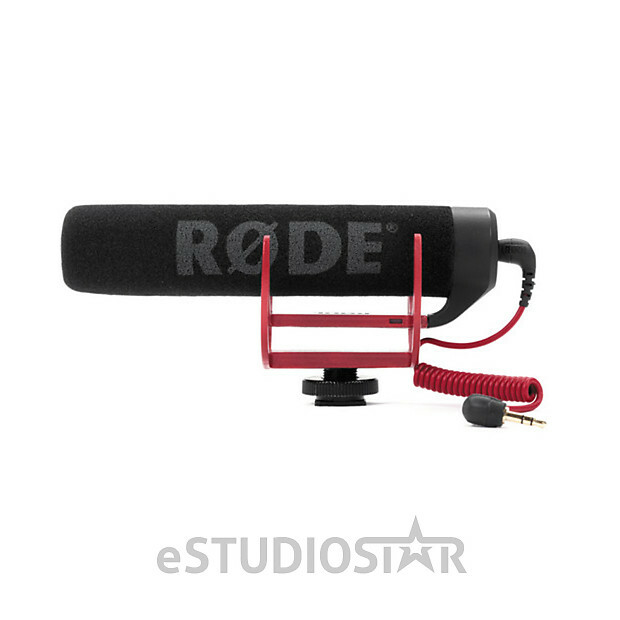 It features an integrated Rycote Lyre shock mount for isolation from bumps and vibration and offers battery-free operation, using instead the plug-in power from your camera's 3.5mm microphone input. Please note that the microphone will not work with cameras that don't supply plug-in power to their 3.5mm audio input jack. The VideoMic GO is a directional microphone. It utilizes a super-cardioid polar pattern to attenuate sounds from the sides, resulting in a signal that sounds closer to the camera, even when shooting in noisy environments or at moderate distances. The integrated shoe mount provides a 38" thread for additional mounting options. A foam windshield and 7.9" dual mono 3.5mm coiled output cable. The VideoMic GO is compatible with the Nikon D4, D800, D600, D7100, D5200, D5100, D3200, Coolpix A, P7800, Nikon1 V2. It is also compatible with the Canon T2i, T3, T3i, T4i, T5i, 60D, 70D, 7D, 6D, 5D Mk II and 5D Mk III. Generally ground shipping is free within the United States. Please contact us for shipping cost outside of the United States.